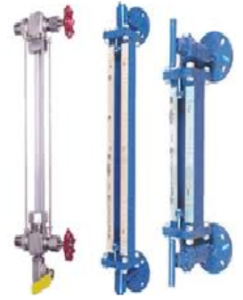 AFIPL manufactures Tubular Level Indicator (Side Mounted) with Tie Rod design, with Scale OR without Scale, with OR without inbuilt Valves. It is a reliable device for reading the level of liquid. It is a simplest form of level indicator. These level indicators find wide application for level measurement in process tanks, batching tanks, vessels etc. 2. We are using 100% PTFE (Teflon) rope as packing to ensure positive leak tightness for full vacuum as well as 6 Kg/cm² service pressure.